Today is the first day of National Cupcake Week! Yes, a whole week devoted to celebrating those morsels of cakey goodness. What better excuse to get into the kitchen and then relax with your baked efforts? I’ve been experimenting with cupcakes for the last couple of weeks to try to come up with some different ideas. Some of my experiments haven’t worked, but mistakes are the best teachers. I came up with the idea for these ones after feeling disheartened by an idea I just couldn’t make work and had to give up on. I wanted something that definitely wouldn’t fail and would be very simple. Australia doesn’t have a lot of unique cuisine. When people ask me what dishes are particularly Australian, I usually find it difficult to give a good reply. But one of the things I most love about my homeland is its eclectic mishmash of cultures and cuisines. Lamingtons are definitely uniquely Australian. They make me think of my childhood and are perhaps one of the reasons I love coconut so much. Their simplicity is probably their biggest selling point – cubes of light vanilla sponge, covered in runny chocolate icing and finally dipped in desiccated coconut. Sometimes they’re cut in half and cream (sometimes also jam) is spread inside, but it tastes much better in its original form. My cupcake version of lamingtons omits the messy dipping into chocolate icing stage. What could be better? You still have the wonderful taste combination, but without all the fiddly work! Divide the mixture between 12 cupcake cases (the mixture should fill the cases about one half or two thirds full). Sift the icing sugar and cocoa powder together. Beat the butter in a large bowl until soft and creamy. Add half the icing sugar and cocoa powder mixture and beat until smooth. Add the remaining icing sugar and cocoa powder, and the milk, beating until creamy. Once the cakes are cool, spread the buttercream icing liberally on top. 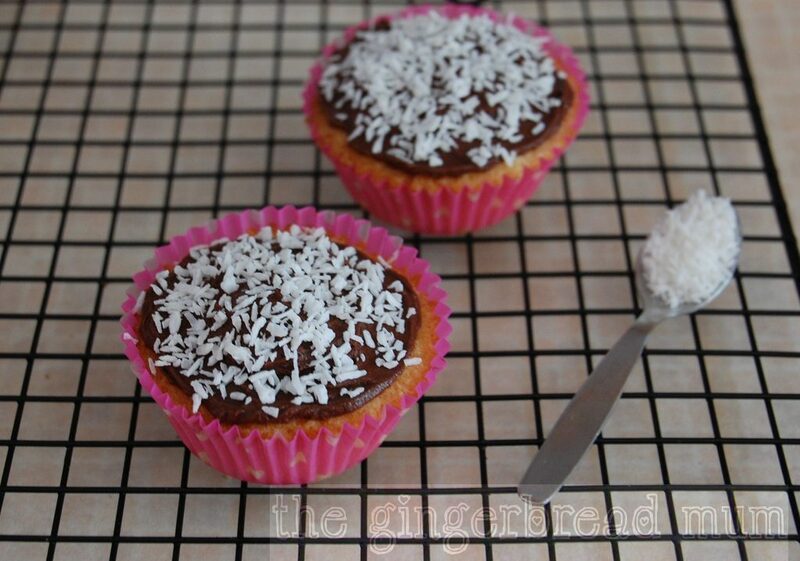 Sprinkly generously with coconut. Posted in family, recipe, snack and tagged chocolate buttercream, cupcake, dessert, lamingtons, National Cupcake Week, recipe. Bookmark the permalink.